Recorded over a five-year period (1990-1995) in Casablanca and Marakkesh by Randy Djamal Barnwell, but adding three tracks by Mustapha Baqbou (licensed from Editions Hassania), this is as impressive a collection as you could ever find of the Sufi Gnawa brotherhood. The brotherhood, spread across Morocco but with its greatest concentration in Marakkesh, is a fraternity whose members descend from slaves brought across the Sahara by Arab traders. They actually claim spiritual descent from the Ethiopian Sidi Bilal, the Prophet Mohammed's first muezzin. Here, many musicians are involved, listed, complete with their nicknames, in two pages of credits. The enterprise has been brought together by the Ishtikhara Media Centre; it is designed to promote an Islamic artistic/ritual form. The CDs come with a 40-page booklet that offers, in addition to extensive notes by Tim Abdellah Fuson, full translations of texts, an excerpt from an article by the Seattle-based ethnomusicologist Philip D Schuyler, notes on three films that those interested might wish to search out, and suggestions for further reading and listening. The package, then, is impressive. The music can occasionally become a little repetitive, sounding a bit too much all the same, and at such points, I find my interest sustained by reference to the background materials. Actually, that last comment was a little unfair, because repeated hearings do reveal new textures and novel rhythmic patterns that delight, despite the fairly limited sound world. The Gnawa brotherhood primarily use just three instruments. A three-stringed long-necked lute, 3 feet or 4 feet in length, the guinbri or sentir, is the main melodic instrument (the booklet starts by labelling the instrument as guinbri, but all the track credits say sentir. Almost identical to instruments found elsewhere in West Africa, this lute is made from a hollowed tree trunk over which animal skin is stretched to form a soundboard. The neck is basically a pole, and the three strings are sheep gut. The strings are tuned in fourths and held with leather bands that serve as tuning pegs. It sounds rather like a string bass, but rather than think just in terms of melody, the recordings reveal the instrument being both plucked and slapped, the forefingers and thumb used to thump the strings (and the soundboard) percussively. The qaraqeb (elsewhere also spelt garagab), a pair of large metal castanets, add to the percussive nature of the music. Castanets are said to be of medium size (four to six inches in length) in intimate groups, but much larger (up to nine inches in length) when played with larger ensembles. A double-headed frame drum, the tabl, is also heard. Struck with two olive wood drumsticks, the drum is hung around the waist and used mainly for processions and for preparing a house for the basic lila ritual held at night. To this, a lead vocalist and a backing group that normally offers a response to the soloist's verses is added. There is some clapping in time. And all this, taken together, gives the persistent texture. Most of the songs are in Moroccan Arabic, but occasionally (for example on tracks 4 and 5 on the first CD) there are phrases based on sub-Saharan languages that suggest a considerable antiquity still exists in the repertory. The drum most often accentuates melodic accents, but will sometimes go off on its own. The castanets, often sounding like damped cymbals, present rapid flurries of punctuation or play sections of intricate patterning. The instrumental melodies consist mainly of short phrases, cells that are repeated as endless ostinato, foundations over which the song is floated. Rhythm is the key, patterns building as time passes, becoming ever faster. Unseen when listening to a CD, dancing is going on, often involving dancers getting lost in the rhythm and passing into a frenzy, perhaps experiencing the trance that Gilbert Rouget so ably discusses in his famous text, La musique et la transe/Music and Trance. Indeed, the aim of performance is ceremonial, moving people towards spiritual union. Schuyler offers an overview to set the scene, in which we are told that Gnawa melodies are usually based on "relatively rudimentary codes [that] may not be sufficiently complicated to relieve the embarrassment of musicologists at the idea of music having internal meaning". No, this is not meant to put the listener off: because the melodies and the instruments are said to talk to Gnawa followers and to the spirits, adherents respond to the gods as they follow the musical flow. It is said that adherents, hearing melodies and rhythms from a distance, will start to experience the emotions and physical sensations, even though they are not present at the ritual. The main Gnawa musical activity is at the lila or derdeba ceremony. This, as does the first CD, begins with calling out prayers to the Prophet. The first two tracks are recorded outdoors, and would be categorised as "entertainment" before the more devotional parts of the ceremony begin. This sequence nicely captures the recording progression: we hear a set of "entertainment" songs, then more devotional tracks that, taken together, build a comprehensive picture of the total ceremony. Right at the beginning, the booklet notes that some ceremonies are more secular than others, but the writer insists that all the songs will always retain their devotional characters. This could be interpreted as a nod to the uncomfortable relationship between Islam and music. But, more than this, it reflects the fact that Gnawa music can be heard at festivals and in market places throughout Morocco. The genre has been recorded before, most notably led by the singers Hassan Hakmoun and Mustapha Baqbou. Baqbou is heard here in the three licensed tracks, but two other notable singers are featured leading all the remaining 13 tracks: Abdenbi Binizi and Ahmed "Baska" Larfaoui. 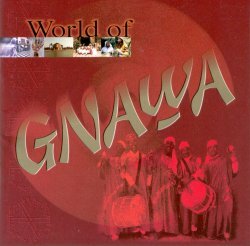 Binizi, on the cover, points out that Gnawa is world music - "you can find Gnawa all over the world". But rarely, if ever, has it been showcased in such a comprehensive way as in these two CDs.